Left: a white giant nudibranch with red-tipped cerata branches. Photo by Mike Munroe. Right: an orange giant nudibranch. Photos by Wiebe Nijland. Note the bright white line running along the foot margin. Like other bushy-backed nudibranchs (Suborder Dendronotina), the back of the giant nudibranch bears many highly branched, bushy cerata. The large rhinophores are also bushy and branched. Four pairs of projections extend from the frontal veil, located in front of the rhinophores. While this species varies in colour (including red, white, grey, and orange), it can be identified by the bright white line that runs around the margin of the foot and by its large size - up to 30 cm long. The branching cerata and rhinophores may be tipped with a different colour from the rest of the body. The giant nudibranch inhabits sandy-muddy subtidal areas to a depth of 200 m. Its range extends from northern Alaska to northern Mexico. The giant red dendronotid (Dendronotus rufus), which can be nearly as big as D. iris, is white with maroon tipped-appendages (cerata and rhinophores) and a red line edging the foot. Other similar Dendronotids lack the giant nudibranch's projections off the back of the rhinophores and the paired projections off the frontal veil. 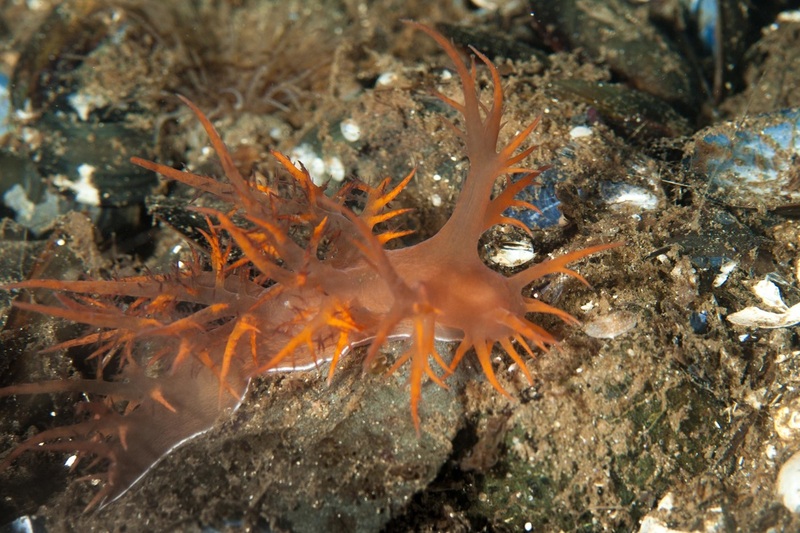 The giant nudibranch feeds on the tentacles of the tube-dwelling anemone (Pachycerianthus fimbriatus), though such predation does not usually kill the anemone. The nudibranch may be pulled into the tube when the anemone retreats, but isn't usually harmed (see video). 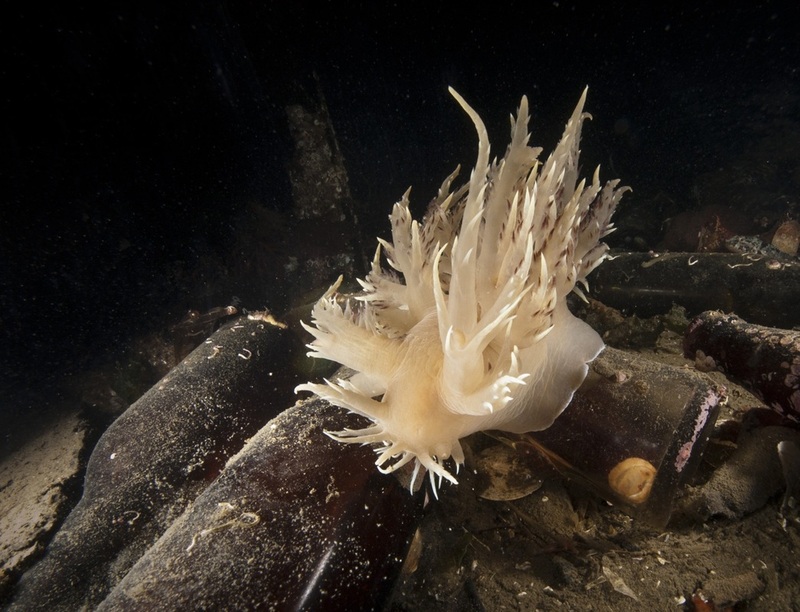 The giant nudibranch also attaches its eggs on the anemone's tube. 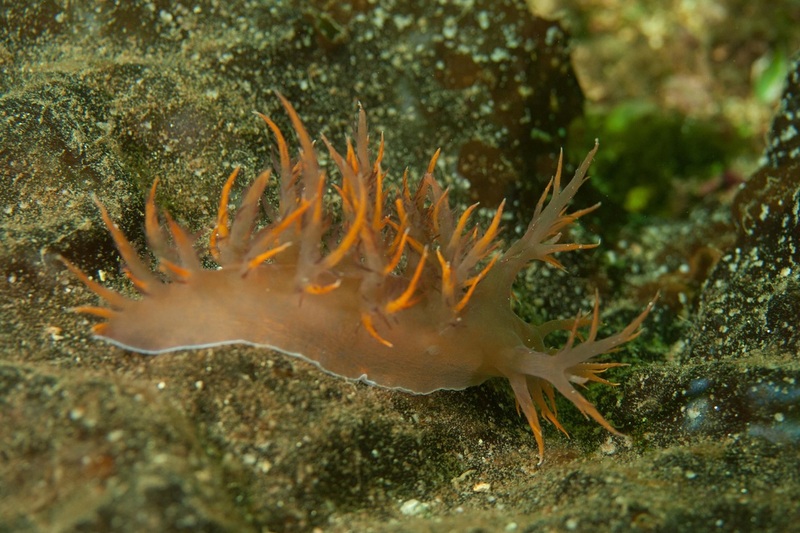 This nudibranch is known for its ability to swim when disturbed. Click here for a video. Cowles, D. (2005). Dendronotus iris (Cooper, 1863). Invertebrates of the Salish Sea. Rosario Beach Marine Laboratory. Accessed 09/12/2014. Harbo, R. M. (1999). Whelks to whales: Coastal marine life of the Pacific Northwest. Madeira Park, BC: Harbour Publishing. P. 155.